Of the remaining 18 publications, six [13–18] included reports of patients with early and advanced gastric cancer. Two of the reports were generated from patients of the same study population [16, 17], and two reports covered the same trial [13, 14]. The remaining 12 publications included six full-text publications [19–25] and six abstracts of presentations held at annual meetings [26–30]. Of these, two congress abstracts reported data included in respective full-text publications of the same trial [26, 27]. The remaining three abstracts referred to trials that have not yet been published in full and were thus excluded. Of the six full-text publications, one contained the protocol of a study that had already been published in full text . Therefore, five publications of five trials remained. Figure 1 shows the study selection process used in the present meta-analysis. In the trials reported by Cai et al., Park et al., Shi et al., and Wang et al. [19, 23–25], all minimally invasive surgery was conducted as laparoscopy-assisted surgery; in the remaining trial , laparoscopy-assisted surgery was recommended, but totally laparoscopic surgery was also allowed depending on the surgeon’s preference. In four of the five studies [22–25], surgical quality was assured by reviewing video records and photographs of the surgical site. 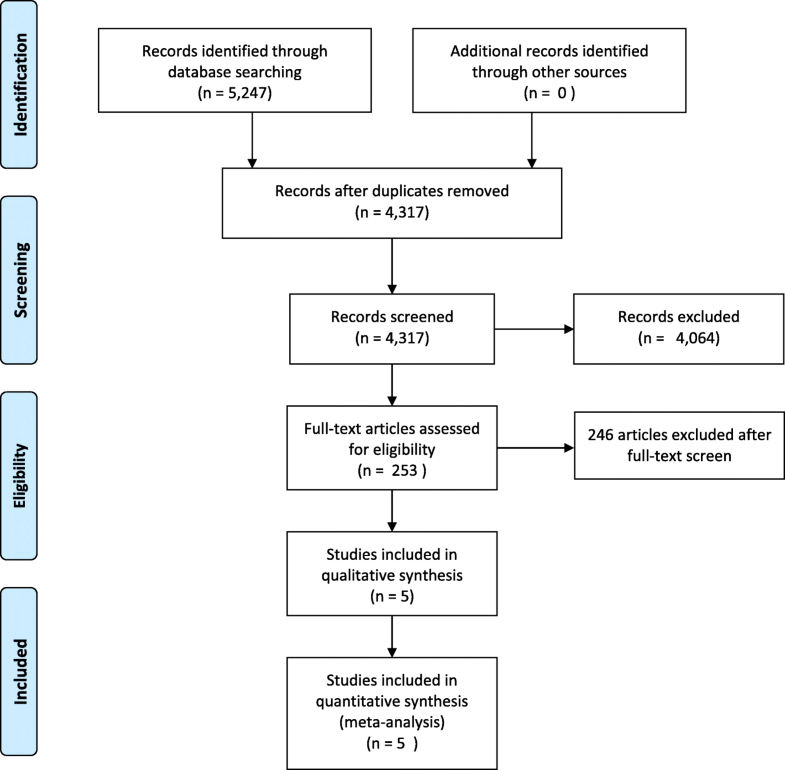 In the trial published by Park et al., completeness of D2 lymphadenectomy was evaluated using a list of checkpoints when reviewing video records . Cai et al. did not report a quality control. This may be due to the fact that only three surgeons participated in this study and only one surgeon performed laparoscopic gastrectomy . The number of postoperative serious adverse events within 30 days following surgery was reported in four of the included trials [22–25]. Park et al. classified the severity of adverse events using the ASCPC classification, whereas the Clavien–Dindo classification was used in the remaining trials. Serious adverse events were defined as Clavien–Dindo grade 3 or higher or severe complications according to the ASCPC classification system. Several RCTs to date have been conducted comparing laparoscopic distal gastrectomy to open distal gastrectomy for gastric cancer [5, 14, 32–34]. 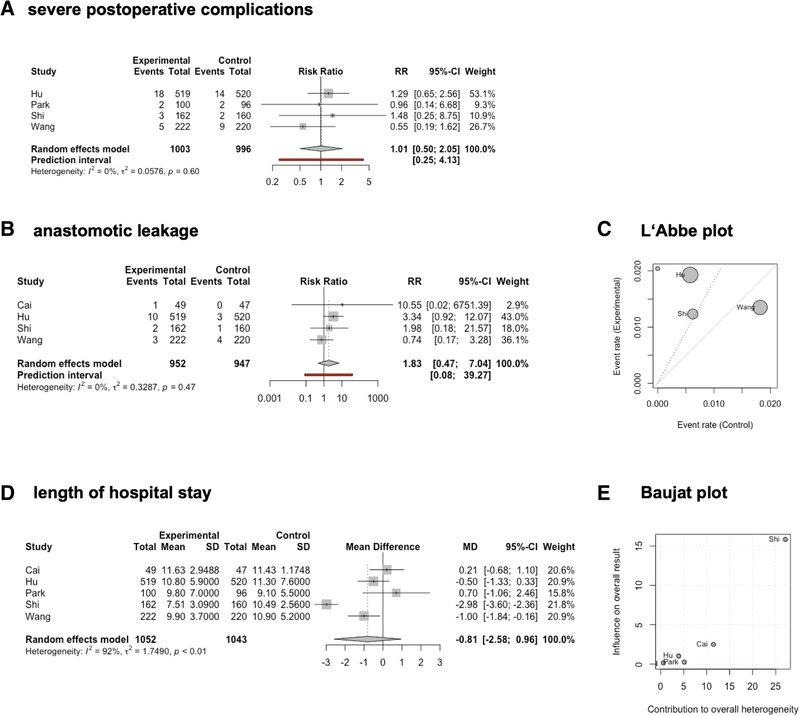 Prior meta-analyses of these trials have suggested improved short-term outcomes, particularly for length of hospital stay for the laparoscopic approach, which was balanced by the time-consuming and technically challenging nature of the procedure [35, 36]. However, a recent Cochrane Review stated that, secondary to wide CIs and the substantial heterogeneity of the data, differences in length of hospital stay need to be investigated further. 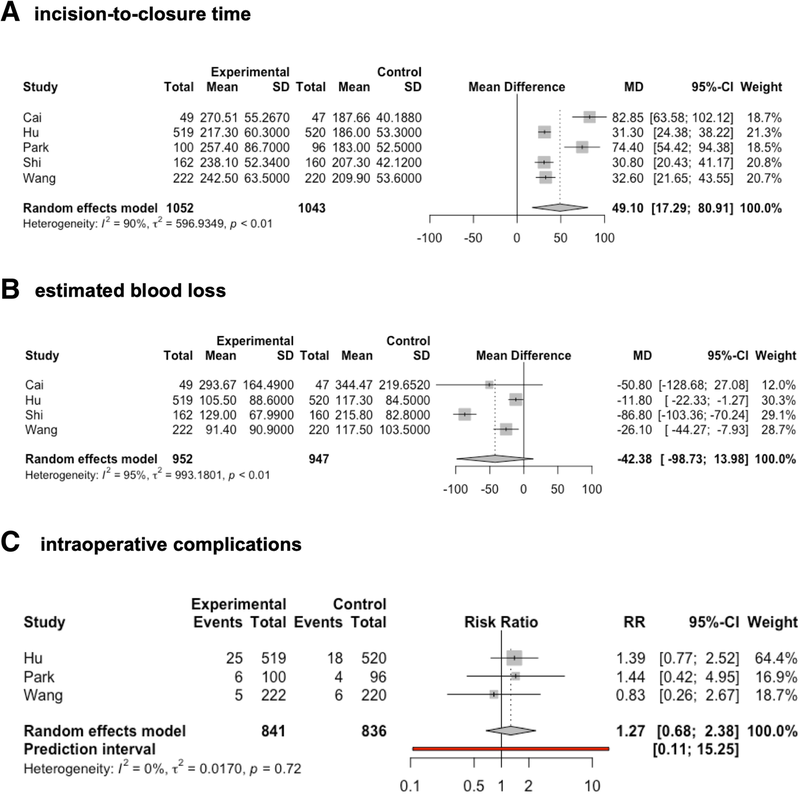 However, there were no statistically significant differences in short-term mortality, long-term mortality, rate of serious adverse events within 3 months of surgery, rate of recurrence within 6 months, rate of recurrence after 6 months, amount of blood transfusions required during or within a week of surgery, rate of any adverse event within 3 months of surgery, quantity of perioperative blood transfused, rate of positive resection margins at histopathological examination, or number of lymph nodes harvested . 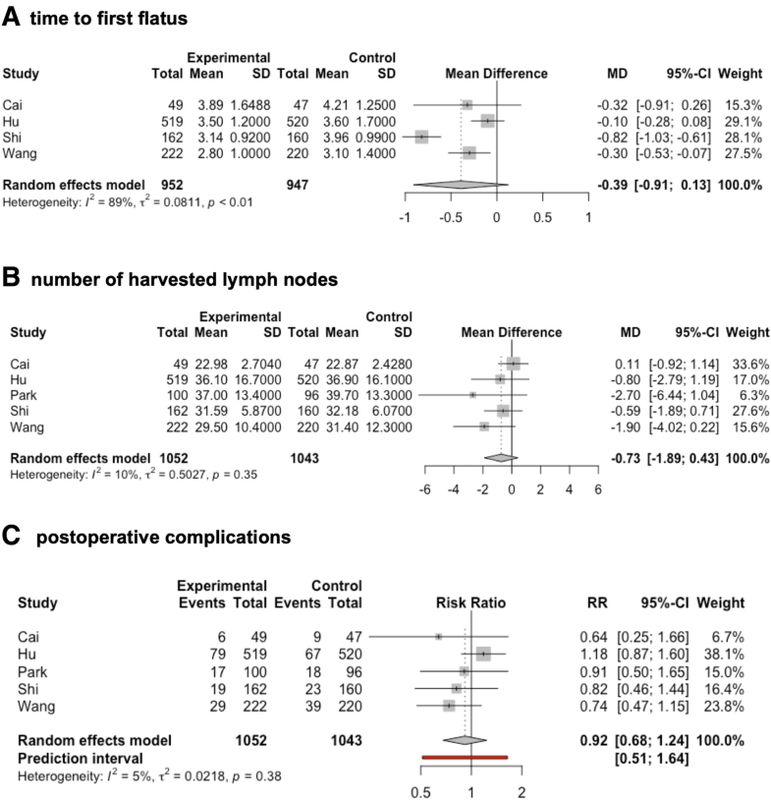 During the last year, three RCTs have been published on the impact of the laparoscopic approach for the treatment of locally advanced gastric cancer [23–25], resulting in a total of five RCTs being available as full-text publications and which provide data specifically for locally advanced gastric cancer.